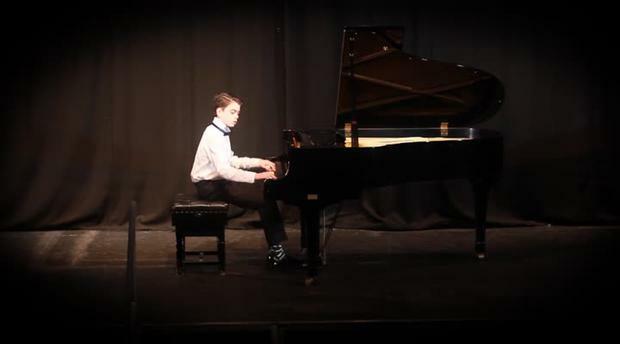 Irish piano prodigy Stan O’Beirne (14) was up against Russians, Lithuanians and Hungarians in their early 20s to claim the Grand Prix prize at the John Field International Piano competition. "There was a jury of four, two of them Russian, one Lithuanian and one Irish pianist (Owen Lorigan)," co-director of the Piano Academy of Ireland Rhona Gouldson-Chen told Independent.ie. "The President of the Jury, Russian pianist, Victor Ryabchikov, described Stan’s rubato (his sense of timing) as 'a Gift from God', not something that is taught." The Grand Prix prize is a concert with the Internationally renowned Belfast-born pianist Barry Douglas, the first non-Russian winner of the Tchaikovsky competition back in the 1990’s. "So, the opportunity to perform with Barry Douglas and his Camerata Orchestra is truly awesome." While there are many talented young musicians in Ireland, Rhona believes Stan has "something very special", as was noted by the jury after his brilliant eight-minute performance. "His teacher Dr. Archie Chen (my husband) and myself have worked closely with him for nine years now and, right from the beginning, we knew we had met somebody very special. But as with all these things, one needs a little bit of luck too! "And so I believe him winning this competition, with it's future magical concert opportunity with Barry Douglas, many doors can be opened. He so deserves all the luck in the world as, along with his wonderful talent, he is incredibly dedicated." Credit: Russian Bridge, Irish organisation who organized the John Field International Piano competition.